Cosmonauts Alexander Skvortsov and Oleg Artemyev conducted an extended seven-hour 23-minute spacewalk outside the International Space Station Thursday, installing a telemetry antenna, repositioning an experiment and jettisoning a mounting fixture after moving another experiment to a recently installed payload boom. 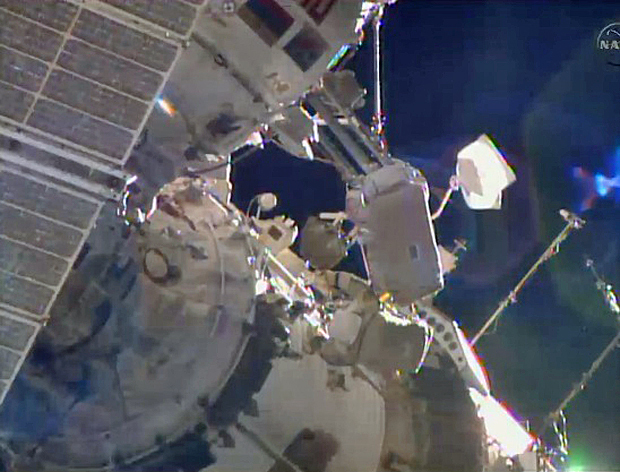 "We had fun today," one of the cosmonauts said from inside the Pirs airlock. "That is for sure," someone else said. A Russian flight controller offered apologies "if we made you work too hard." The excursion began at 10:10 a.m. EDT (GMT-4) and ended at 5:33 p.m. when the cosmonauts returned to the Pirs airlock and docking compartment. The spacewalk ran longer than the expected six-and-a-half hours because of minor but time-consuming problems with a balky latch and a tight bolt holding the jettisoned mounting fixture in place. The new phased array antenna was mounted on the hull of the Zvezda command module to facilitate high-speed telemetry between the space station and flight controllers at the Russian mission control center near Moscow. Skvortsov and Artemyev had problems getting one of three latches secured and in the end used cable ties to complete the antenna installation. The spacewalkers then swabbed one of Zvezda's porthole windows to check for thruster residue and moved a plasma wave experiment to a different location. The final major item on the agenda was to remove a materials science space exposure pallet from a mounting frame and to attach it to a recently installed boom. The mounting frame then was removed and jettisoned, released in the station's wake along a trajectory that ensured no re-contact with the lab complex. The boom carrying the materials science experiment then was erected and locked in place to complete the final major objective of the spacewalk. Skvortsov and Artemyev then made their way back to Pirs, bringing a protective antenna cover back inside with them. 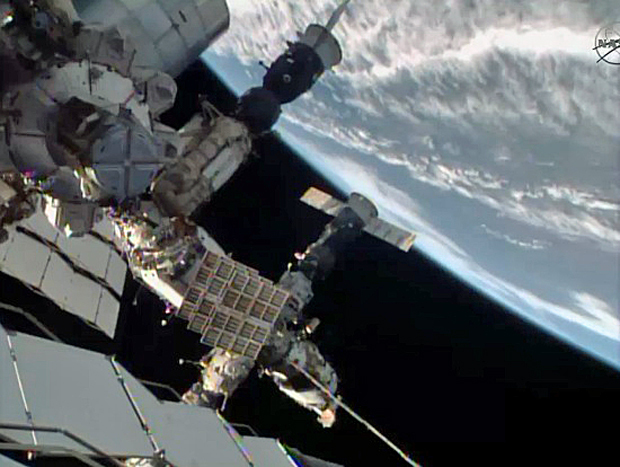 This was the 180th spacewalk devoted to station assembly and maintenance since construction began in 1998, the third so far this year and the first for Skvortsov and Artemyev, the 115th and 116th people to walk in. Total station EVA time by 116 astronauts and cosmonaut representing nine nations now stands at 1,130 hours and 51 minutes, or 47.1 days. Three hours into a planned six-and-a-half-hour spacewalk, cosmonauts Alexander Skvortsov and Oleg Artemyev have completed installation of a phased array antenna on the space station's Zvezda command module that will be used to beam high-speed telemetry to the Russian mission control center near Moscow. It took the cosmonauts longer than expected to complete the installation after running into problems with a tight clamp, one of three in the antenna's mounting hardware, that refused to seat properly. After a bit of discussion on the ground, flight controllers told the cosmonauts to use wire ties to secure the third attachment fitting and to press ahead with cable connections. Remaining work includes relocation of a plasma wave experiment, the collection of samples from a command module window to check for thruster residue and relocation of a materials science/space exposure experiment to a payload boom. The original mounting fixture will be jettisoned. Russian cosmonauts Alexander Skvortsov and Oleg Artemyev opened the hatch of the Pirs airlock/docking module at 10:10 a.m. EDT Thursday to officially begin a planned six-and-a-half-hour spacewalk. The goals of Russian EVA-38 are to install an antenna array on the hull of the Zvezda command module to provide high-speed telemetry to the Russian mission control center near Moscow; to relocate a plasma wave experiment; to collect samples from a command module window to check for thruster residue; to make sure an equipment mounting assembly is secure; to move a materials science/space exposure experiment to a payload boom and then to jettison the original mounting hardware. 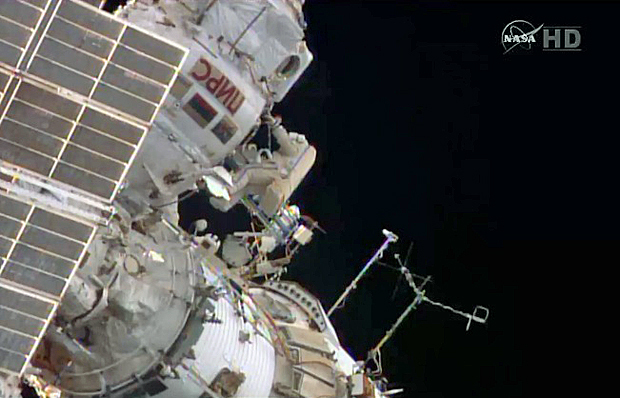 For identification, Skvortsov, call sign EV-1, is wearing a spacesuit with red stripes while Artemyev, EV-2, is wearing a suit with blue stripes. This is the 180th spacewalk devoted to station assembly and maintenance since assembly began in 1998, the third so far this year and the first for Skvortsov and Artemyev. Going into the excursion 114 astronauts and cosmonauts from nine nations had logged 1,123 hours and 28 minutes of station spacewalk time, or 46.8 days.